Buddhists of all nations and traditions practice life liberation, or, the saving of animals from imminent slaughter. In Tibet, this practice is imbedded in the culture so strongly that animals can be seen everywhere with colorful yarn hanging from their ears, marking them as “saved” for life. The animals are then cared for by a family or monastery, and continue to provide milk and hair or wool for their keepers. Buddhism teaches that taking the compassionate action of saving beings from death creates such positivity as to clear obstacles, heal, and purify karma for the one who is requesting the liberation, as well as for others to whom this practice is dedicated, in this life or after death. 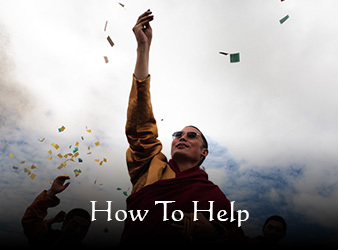 This practice was written about in the New York Times, with some of the information provided by Kilung Rinpoche. 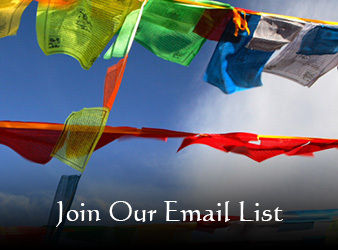 From across the world, anyone can request that a life is saved through Kilung Monastery’s efforts. Yaks, sheep, or goats are purchased from slaughter, or less dramatically, through an arrangement with a family who promises not to kill the animal for life. Family arrangements are less costly than intervening at the time of slaughter. Whatever the choices, saving an animal from imminent death has the most powerful effect. After the animals are identified and saved, the monks and lamas gather with the animals for a blessing ceremony that dedicates this meritorious action for the benefit and happiness of all involved, and extending it outward, to all the beings of the universe. 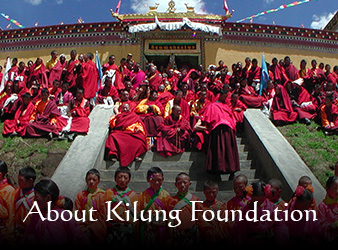 Kilung Monastery and community created a life release farm just for this purpose in 2008. This has been enormously inspirational for Kilung community and monastery, as it supports this very common practice in the area. The farm is run by two families whose livestock were few, and could use the opportunity to build up their herds. Animals that have been liberated are given to Kilung Monastery, who in turn give the animals to the farms for caretaking. The milk products and offspring are shared between the monastery and the families. This yak was saved from slaughter by an American Buddhist friend of the Kilung Foundation. The yak even got a name: Todkar. Instructions for requesting animal release…. Please designate the purpose of your donation under “special instructions”. All different kinds of animals are saved in different places around the world, including insects, birds, and fish. Here Kilung Jigme Rinpoche conducted a large life release ceremony of fish for Chinese Buddhists. The fish were freed into a large river near Chengdu, Sichuan Province.